Yes, I thought this was an odd combination at first. Still, the appearance of the Holy Grail tapestries alone was enough to persuade me to visit the Love is Enough exhibition at Birmingham Museum & Art Gallery. And, in fact, I found it a more convincing juxtaposition than I’d expected. I quite like surprising combinations of things, and these two artists, a century apart, were, as the exhibition guide explains, both essential to modern art and culture, the most influential artists of their times, and with some surprising similarities in their approaches, at least. Both were innovative, commercially-engaged, with successful businesses; both believed in art for the masses and in bringing art into everyday life; Warhol is quoted as saying that an artwork or product must be available to all, which distinctly echoes Morris. Moreover, both were overtly political, as well as interested in creating iconic images, if very different ones. 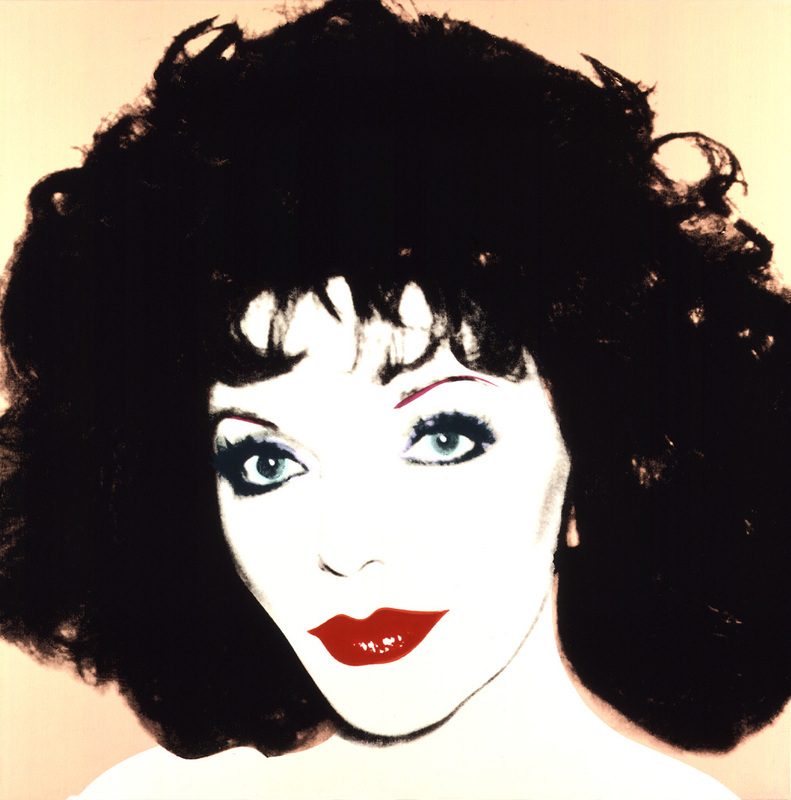 The exhibition opens with the amazing combination of Warhol’s image of Joan Collins and Rossetti’s La Donna della Finestra on William Morris’s Blackthorn paper – and the iconic beauties, so different, seemed to fit well together, oddly enough. A section entitled ‘Camelot’ brings together the Grail tapestries produced by Morris & Co, which are, as I expected, stunning (this isn’t the first time I’ve seen some of them but they seem to offer something new every time) with Warhol’s 1960s America and images of the Kennedys and Marilyn Monroe. The Grail tapestries depict scenes from King Arthur’s court at Camelot, while of course Camelot is also used to refer to the presidency of JFK. Both artists were, of course, obsessed with mythology and beautiful (doomed) people (medieval, in Morris’s case; Hollywood, in Warhol’s) and recreated it endlessly in their work – both, however, from a position as outsiders looking in – however important their work seems now, and however crucial to the culture of the period, their status as excluded from the places they idolised made them significant observers. 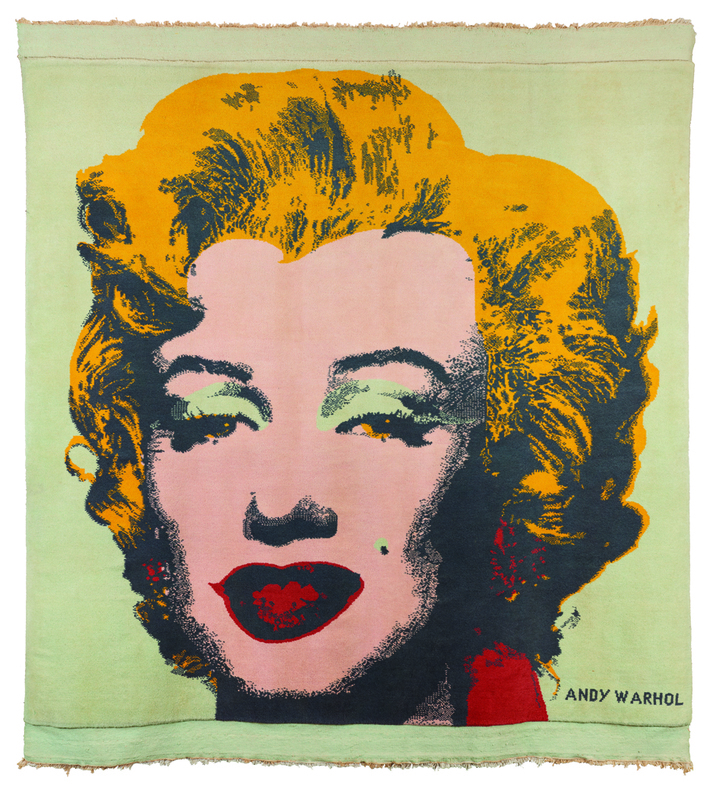 The ways in which we re make our dreams is perhaps a subject of the exhibition, and the contrast between the works is fascinating – the depth in the tapestries when compared with the perfect flatness of Warhol’s work, for example. 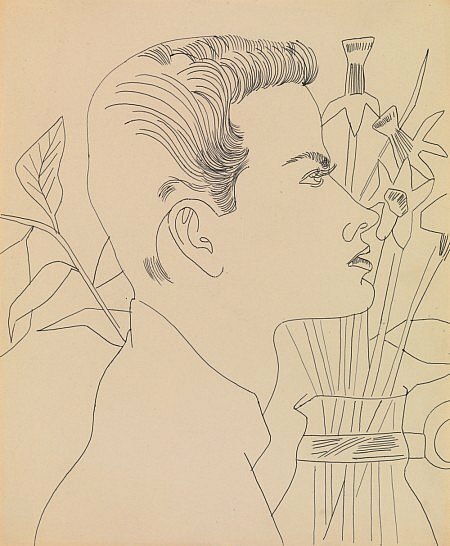 The exhibition notes carefully point out that Warhol was in many ways a true devotee of Hollywood, not merely pointing out the ironic possibilities of reproducible images but genuinely paying homage to those he saw as beautiful or deserving. Much is made of the men’s political leanings, as utopian socialists who wished to see a future filled with art and equality (sounds good to me!) in which beauty took priority over almost everything. Of course this necessarily raises questions about the availability of art, and both men focused on designs which were easily and frequently reproduced, allowing every home to have some form of art in it; of course, this is also a commercially brilliant scheme! Both had businesses – Morris & Co and The Factory – to produce and promote their work; Morris also wrote socialist pamphlets, some of which are on display here, while Warhol founded Interview magazine to provide a mouthpiece for himself and those of similar views. space central to the exhibition, with the Grail tapestries, a Marilyn Monroe tapestry and the Kennedy’s, is breathtaking. Somehow bringing the work of the two men together gives it even more relevance and appeal (though I confess I certainly still prefer Morris). 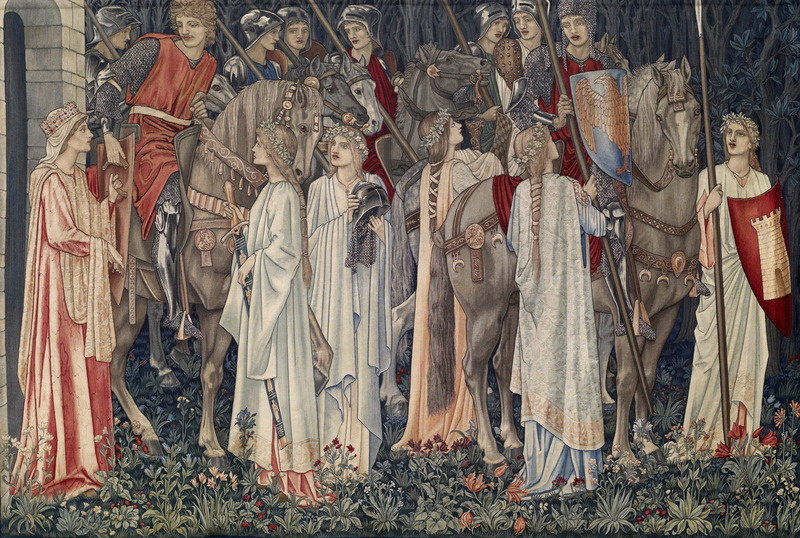 The tapestries tell a story, of a doomed quest for the Grail, from its beginning in a hall with King Arthur to the finding of the Grail by Sir Galahad. In fact, there is so much in these tapestries: they tell a story, and it includes love, death, fear, failure, fighting, betrayal, and dinner. One might argue the same is true in the echoes conjured up by Marilyn and the Kennedys. The final section, entitled ‘Flower Power’, contains what you’d expect: a lot of Morris wallpaper – all beautiful, of course, and several printing blocks too, alongside some flower designs by Warhol, which are as much of their time – and as timeless – as Morris’s are. Printing blocks remind us of the interest in reproducibility that both men sustained. Some of the images are almost like a psychedelic version of Morris’s work; though no mention is made of whether Warhol was interested in Morris’s work, I can’t help but think he must at least have known of him. The exhibition makes Morris seem somehow more modern, and Warhol more traditional, than one might expect. The title of the exhibition is taken from one of William Morris’s poems – one which was read at my wedding, in fact. It suggests that both artists shared an intense love of art, people, and the world around them. Reblogged this on @mdoness … her blog. Reblogged this on Kate Longmate.